It’s finally starting to feel cold enough in NYC that we’re all questioning whether now’s the right time to start dusting off our winter parkas. If your teeth are already starting to chatter when you walk outside, this post might send extra shivers down your spine. 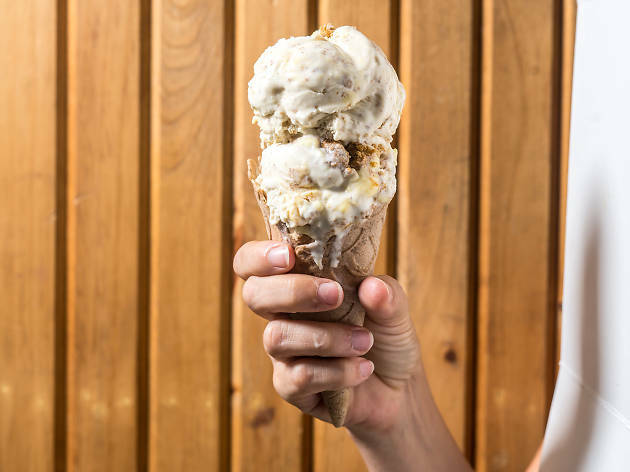 There’s going to be an outdoor ice cream-eating contest in Park Slope on November 18, and the competition (hosted by SkyIce) is serious. 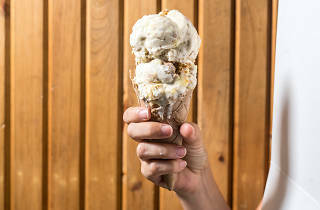 Nine contestants chosen from more than 50 applicants will test their spoon shoveling skills and attempt to polish off a pint of SkyIce’s Thai Tea flavor ice cream as quickly as possible. The current record to break is held by Patrick Garcia, who finished his frozen treat in two minutes and 20 seconds in last year’s contest. (We’re getting a brain freeze just thinking about it.) The grand prize is a $100 gift certificate to SkyIce (duh) and you get a plaque. The event itself should be enjoyable for those not competing too. The mini street fair comes with free ice cream and Gorilla Coffee samples (something warm, thank god), and there will be a DJ spinning tunes. No matter how you feel about eating a frosty dessert during the chilliest time of year, one thing is certain: This event is going to be pretty chill. The event will be held at SkyIce (63 Fifth Avenue) on Sat, Nov 18 at 1pm. Contest begins at 2pm.